Gray wolves, or timber wolves as they are called when they live in the woods, are canines that resemble large domestic dogs in many ways. On average, adult gray wolves are between 3 and 5 feet long and females can weigh between 60-100 pounds with males tipping the scales at 70-145 pounds. These canines are recognizable by their predominately gray, white, and brown coloring, and have long bushy tails. Wolves are carnivores that feast on mammals, including deer, moose, beavers, rodents, and hares. They typically live for 8-13 years in the wild, but can survive more than 15 years in captivity. 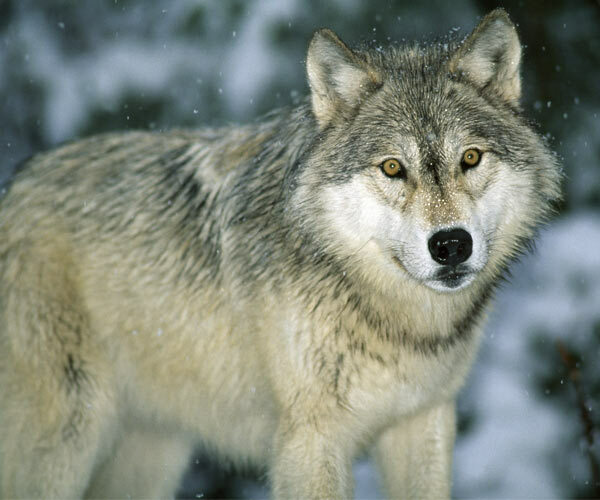 Although wolves are native to the Adirondacks, they went extinct in the region for a long period of time. In the 1800s, wolves were abundant within the Blue Line, but deforestation and unregulated hunting wiped the species out. Until recently, it was thought that the last wolf in the Adirondacks was shot in the late 1890s, but a 2011 study brought to light the fact that a wolf was killed north of Great Sacandaga Lake in 2001 and two others were bagged from Vermont's Northeast Kingdom in 1998 and 2006. This suggests one of two things: either wolves that were raised in captivity found a way to escape or wild wolves are beginning to re-populate the area they once called home. After examining the carcasses of the wolves, scientists were able to determine that all three were indeed wild, but were unable to identify where they originated. If the wolves came from the upper Great Lakes or Ontario's Algonquin Park, scientists believe it is likely that others will follow in their footsteps, and the species could begin naturally increasing its numbers in the region. If wolves are currently living in the Adirondacks, it is likely that their numbers are extremely low, but some advocates are calling for New York State and federal wildlife agencies to assist with the population boost. Those advocates identify wolves as being key predators in the food chain, as well as an iconic species of wildlife that could attract tourists to the region, just like moose and bald eagles do. The DEC has recently expressed that it is not interested in helping wolves return to the Adirondacks at the present time due to a lack of funding and personnel. In addition to physically transporting animals to the region, specific hunting regulations would need to be put in place to prevent coyote hunters from mistaking wolves as their targets. Even without outside help, it is possible that wolves could repopulate themselves in the Adirondacks, just as they have in the Great Lakes region and Canada. Although some may fear that an increase in the wolf population will lead to attacks on humans, those familiar with the species insist that wolves don't see humans as prey, and therefore are not predisposed to attack them. Only time will tell whether the howl of wolf packs will intermingle with the echoing call of loons in the Adirondacks.